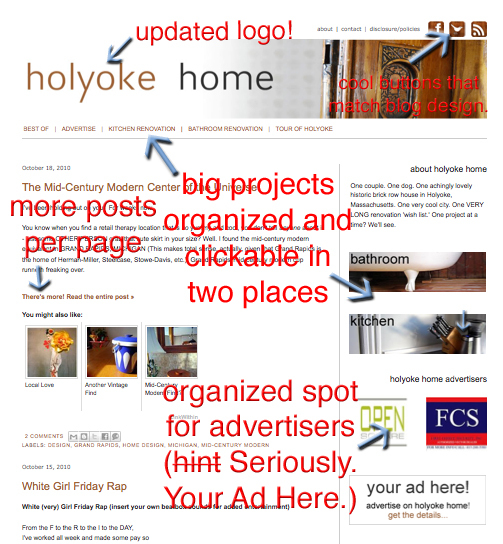 We started Holyoke Home a year and a half ago, and other than a personalized banner design at the beginning (thanks www.artbureau.com) and a few code tweaks here and there, Holyoke Home was pretty standard Home and Garden blog visually. I worked with www.cdevision.com on a new look LAST MONTH. Oops. I am clearly a GENIUS marketer. I hope you've been enjoying noticed the changes. All your makeovers seem to work beautifully! I did notice your wood-themed social media buttons at the top!